Learn how to create seamless composites in this Moraine Lake Sky Replacement Photoshop Tutorial. This image was created out of a desire to make something good happen out of what can only be described as a disastrous shoot that did not go the way I hoped it would. If you aren’t familiar with the Moraine Lake area, the 11km road up the mountain to the lake is closed to vehicles in the winter. It’s only accessible if you hike, bike, or ski in. So last spring, about two weeks before the road was set to reopen, my partner and I decided to go and do some night shooting. We wanted to get there before it was open to the public so that we could set up a timelapse. We were also doing a product shoot for tentsile (you know, the tents that hang from trees). So we figured that with all of our gear – 4 cameras, 4 tripods, and slider gear for timelapsing, as well as all of our warm clothes, tent, and food – that our best option would be to bike up to the lake and tow our gear in a bike trailer. This was NOT one of our better ideas! First of all, I haven’t been on a bike since I was 13. I didn’t fall off, but my legs were not prepared for the 15 km bike ride from the rental shop up the side of a mountain. My partner lost his jacket somewhere along the road when it fell off the trailer. Then, when we got there, we struggled for over two hours trying to find a somewhat level spot to hang the tent. And after all that, the milky way didn’t line up over the mountains before the moon came out, and sunrise was a blue sky bust. We biked home the next morning, after getting zero sleep, and not a single good shot between the two of us in temperatures so cold that our skulls ached. This composite was my attempt to produce something out all of that effort! I decided to combine one of my blue hour shots from Moraine Lake with a milky way shot that I had taken in Hawaii a few months before. SAVE 30% when you purchase all three Milky Way tutorials in the ‘Milky Way Collection’! Learn the basics in ‘Standing on Stars’ and blending techniques in ‘Timeless’. Follow that up with ‘Moraine Lake Sky Replacements’ and you will be fully equipped for Milky Way season! Simply add all three items to your cart and apply the discount code ‘milkyway3‘ to save $32.00! SAVE 30% when you purchase all three Milky Way tutorials in the ‘Milky Way Collection’! Learn the basics in ‘Standing on Stars’ and blending techniques in ‘Timeless’. 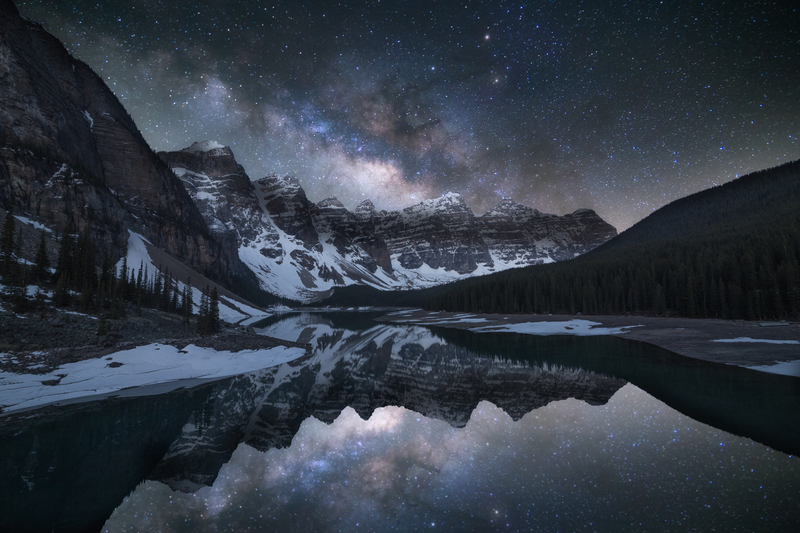 Follow that up with ‘Moraine Lake Sky Replacements’ and you will be fully equipped for Milky Way season! Simply add all three items to your cart and apply the discount code ‘milkyway3‘ to save 30%!